Have you ever stayed at a Hampton Inn? If so, chances are very good that you have run into their particularly perverse room floor plan. Most of the Hampton properties I’ve visited have this floor plan so I assume it’s pretty standard. The interesting aspect of this, to me at least, is that hotels in general have tried (half-heartedly) to embrace the business traveler. Increasingly, they have desk-top power outlets, nightstand power outlets, audio-visual panels to hook the laptop into the TV, high-speed Internet access, comfortable desk chairs and so forth. In fact, Hampton Inn has been adding these features lately, presumably to woo or simply retain business travelers. But one gets the feeling that whoever laid out the floor plan has never actually lived and worked in the hotel. If it were up to me, all hotel interior designers and management would be sentenced required to stay in the properties where they work. Not just overnight, but for a week at a time. Yes, you see that correctly. The desk where you are expected to sit and work is positioned directly in front of the HVAC unit and across the room from the thermostat. If the unit is set to cool, you freeze your arse off. If it is set to heat, you sweat your arse off. Either way, you had better not have a case of Dry Eye before staying here because the fan will be blowing across your face the whole time. You may have a severe case of Dry Eye by the time you leave, though. The fix for this isn’t as good looking but would be incredibly more functional and has the benefit of being simple. Just swap the desk with the luggage stand as shown in the photo above. There is no possible way that the interior designer or any of the executives who review and approve the designs have ever stayed in a Hampton Inn with this floor plan because if they had they would have ordered it changed after sitting for five minutes at the desk with the HVAC turned on. Assuming, that is, they don’t come down with pneumonia and die right there in the room. In fact, I’m a bit surprised that there hasn’t already been an episode of CSI based on this. DB and Finn would first get the time-of-death wrong because by the time they find the body it would either have frozen into a corpsicle or else dried and ready to be sliced into Guest Jerkey strips, depending on the HVAC setting. Then, after questioning the manager, the maid and a random sampling of local hookers, they’d eventually realize no foul play was involved. It’s simply “death by Hampton Inn.” Mystery solved. Don’t get me wrong, I’m not saying the Hampton Inn is a crappy hotel. In fact, it’s one of the better mid-tier hotels. The problem is that the hospitality industry doesn’t set a very high bar. Generally they say that they cater to business travelers but the features they tout are empty marketing and lack substance. For example, it isn’t “high speed” Internet access if it can’t beat the speed of tethering my phone. It isn’t wired Internet if the retaining clip on the Ethernet cable is snapped off and the cable falls out if you so much as breathe on it. It isn’t a desktop power outlet if the socket is dead, pops out exposing bare wires, or is broken. The room effectively doesn’t have an iron if the iron in the room has burn residue on the plate and ruins your shirt. The room doesn’t come with a refrigerator if the thing in the room that looks like a refrigerator is really a mold incubator that keeps food at a steady 45 degrees Farenheit. Typically, a Hampton doesn’t suffer from all of these things at once and so it is better than most. 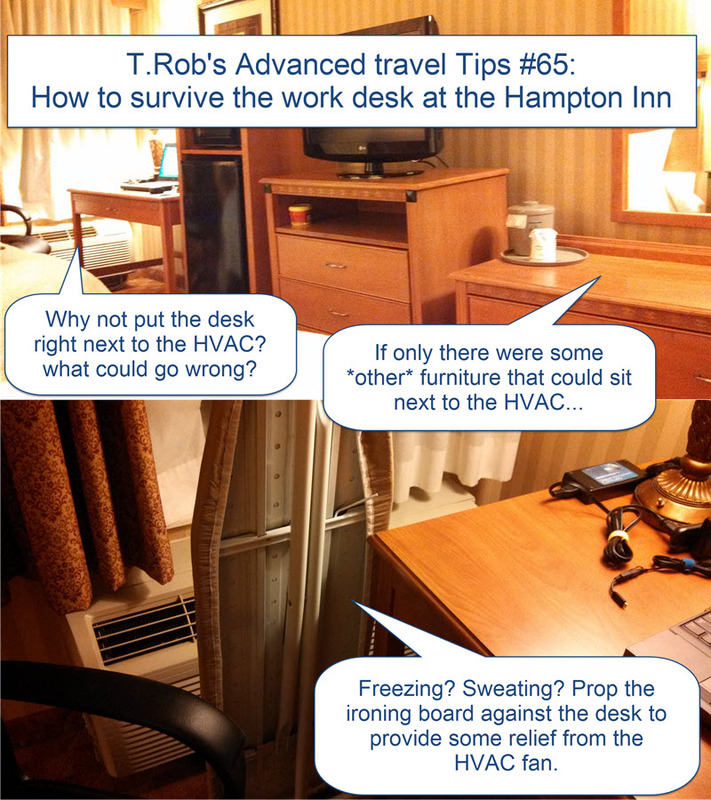 More importantly, the one stupid thing Hampton does with bewildering consistency – the desk in front of the HVAC – has a convenient workaround by using the ironing board as a handy windbreak. Of course, it’s not as effective a windbreak as a tall hedge. But then a tall hedge in the hotel room would be stupid. This entry was posted in Clue train, Rant and tagged fail, hampton, hilton, hilton executives, hospitality, IMHO, life, marketing, quality, rant, travel. Bookmark the permalink. A friend pointed out that they have a pool there at the Hampton and wondered how quick one might contract pneumonia sitting at the desk after a dip in the pool. Hmmm… we’d probably know except all the test subjects were quickly turned to corpsicles. Then my brother called to say the chair right in front of the HVAC is a *feature* for him. OK Nick, but I honestly think you are in the minority. I may be proven wrong in the informal survey that is the Comments section but even if that’s the case, just from a human health and liability standpoint you don’t design a room so guests sit on top of the HVAC any more than you design a bathroom so narrow you can only hold the hair dryer right next to your body on full blast. Extreme heat or cold is injurious. Thanks, Neal & Stretch for the comments and the read! I haven’t yet run into a Hampton room with the desk positioned like that, but regarding broken items, I make a point of checking stuff upon arrival and calling maintenance if necessary. And have walked a few clock radios down to the front desk. And the current desk chairs are fantastic compared to what they replaced a few years back! The one fairly common annoyance that I run into at the Hamptons though is the shower curtain height. Ever since they went to that curved curtain rod some years ago, they appeared to have done nothing about checking what that meant to the curtain. In many rooms the curtain barely stays in the tub now. I comment on that on their surveys. But as T Robb said, having them actually spend time using their rooms’ features would probably open their eyes. More than a survey. Very funny, I agree hotel designers NEVER stay in the room they design.